You might consider as an April Fools’ prank or a joke of some kind but, it is 100 percent true. Ashton Kutcher has been attached to play the role of Apple co-founder Steve Jobs in an upcoming biopic. So what were the factors that came Kutcher’s way that allowed him to bag such a high profile role in probably the most anticipated biopic in recent history? 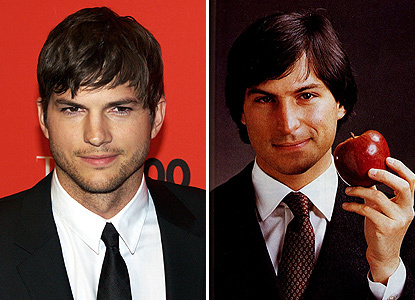 No one really knows but one thing going for Kutcher is that he actually looks little like Jobs when he was young. So that’s at least one thing going for him – he looks like the person he’s set to play in the movie. I know you guys are worried that Kutcher won’t have the emotional range to tackle a demanding role in a biopic, but he’s not all crazy and wacky roles. Remember, that he has appeared in a number of movies that have a serious theme, among them Bobby, which was directed by Emilio Estevez. I’m hoping he’ll do justice to the role and pull in a decent performance. The Jobs biopic will be directed by Joshua Michael Stern, whose last project was Swing Vote. Filming for the movie is slated to begin next month, which is when Kutcher will be finished with his Two and Half Men commitments.